Social challenges such as mental illness, long-term health conditions and social isolation, have a huge impact on people’s lives. And often, due to their complex nature, they can be very difficult challenges to tackle. The rapid emergence of digital tech offers the exciting prospect of being able to create new approaches to tackling these challenges that are more effective than current solutions. But developing new digital products and services isn’t an easy task either. So what happens when we combine the two? Is it possible to use digital tech to create new and effective approaches to some of society’s most pressing challenges? Our 10 years of experience in funding and supporting socially motivated tech has shown us that it is possible. By supporting early stage ventures, we’re demonstrating tech’s enormous potential to transform (and save) lives, and we’ve learnt a lot along the way. In December 2013, we launched the Social Tech, Social Change programme. The aim of the programme was to help realise the full potential of early-stage social tech ventures, through grant funding and targeted support. Social Tech, Social Change rapidly evolved into Social Tech Seed, a refined version of the programme that remained focused on getting early stage ventures investment-ready in order to scale their social impact. We’ve revisited 22 social tech ventures funded through the fourth, fifth and sixth rounds of Social Tech Seed to see how they’ve grown since our early stage funding. 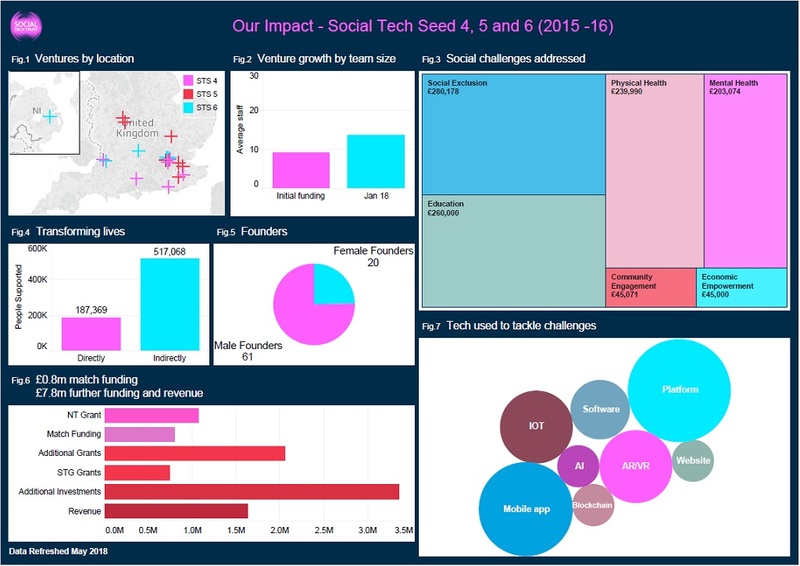 The dashboard below gives a snapshot overview of our Social Tech Seed 4, 5 and 6 grant fund. You can also see an individual summary for each cohort here: Social Tech Seed 4, Social Tech Seed 5 and Social Tech Seed 6. When it comes to tech that is transforming lives, we have funded some inspirational ventures. GiveVision’s SightPlus headset has been transformative for hundreds of people with limited vision and sight loss, enabling users to see text, television, and even faces for the first time. Meanwhile, Konnektis is completely overhauling the way that home-based care is provided by digitising traditionally paper-based records and connecting previously unconnected services. Through careful user-centred design and digital integration, it’s aiming to transform care for hundreds of thousands of people across the UK. More than 187,000 people have directly benefitted from the ventures we’ve funded through Social Tech Seed 4, 5 and 6 – that’s significant social impact, unlocked as a result of new digital products and services that didn’t exist just five years ago. The Social Tech Seed programme provided support to social tech ventures at an early stage in their development. Ventures would apply with a functioning digital prototype, one that they had tested with people to make sure that it worked and there was a real demand for it. The Trust’s funding would then support them to take this prototype to the point where it was market or investment ready. This last point is critical. Our support was targeted at an early stage and typically only for a year. If these new social tech products and services were to achieve anything like their full potential they would need to attract further funding, either through larger grants, investment and/or income. The critical question was: would our early-stage support help unlock more significant resources? It’s still early days, but the financial evidence to date is encouraging. The 22 ventures that made up the fourth, fifth and sixth cohorts of Social Tech Seed, received £1.1m of grant funding from us. This immediately unlocked £0.8m match-funding – additional funds from other sources used to complement our grant. Since we started supporting early stage social tech ventures in 2013 we have seen increasingly diverse and sophisticated digital tech being used to address important social issues. While earlier Social Tech Seed funding rounds were dominated by online platforms and apps, the more recent rounds have seen artificial intelligence (Troo.ai), 3D printing (Open Bionics), Internet of Things (Digital Farms) and blockchain (Alice) all being harnessed for social transformation. What’s even more interesting is that we’ve found that the most innovative ventures are actually the most successful in securing additional investments and revenue. Far from being seen as too high risk and scaring potential investors away, cutting edge tech and a clear vision for using it to transform lives, is a compelling investment proposition. Of the 22 ventures supported in Social Tech Seed (4, 5 and 6), the 8 most innovative (36%) accounted for 51% of additional post-grant funding secured across those three funding rounds. That’s £3.9m of a total £7.8m additional grants and investments. In addition to the trends we’ve identified above, there are other encouraging patterns emerging from the data. Across each of the fourth, fifth and sixth rounds of Social Tech Seed, organisations have grown with the majority (73%) creating new job roles. Resilience also appears to be high, with none of the mostly young ventures (68% are less than 5 years old) having been dissolved or liquidated. However, it is also clear that even the most successful ventures are still at relatively early stage in their journey, and are still some way from realising the full potential in terms of scale, reach and social impact. Even in purely commercial contexts it can take the best part of a decade to grow a new tech venture from its inception to full success. The fourth round of Social Tech Seed was launched less than 3 years ago, and the sixth round less than 2 years ago. The 22 ventures supported in these recent rounds are still young, and at an early stage in their development. The social tech startup journey is often a difficult one, and far from the smooth exponential growth curve in some startup blogs and textbooks. The ventures supported by the Trust have grown in ‘fits and starts’, often facing periods of slow growth, and significant obstacles, before making big leaps forward. Innovation is hugely exciting. However, without the ability to replicate or scale innovations that are proven to be effective, the social impact of tech will be unable to reach its full potential. We want to avoid creating lots of potentially life changing and transformative social tech services, that only reach a small percentage of the people who could benefit from them. The evidence of success and growth is very encouraging, but there’s still some way to go for our supported ventures. The technical and social challenges are complex and very real. Whether it’s building an app that provides a deeply immersive environment for children affected by bereavement, or creating facial tracking software to help people affected by facial paralysis, the tech being used by the Trust’s ventures is highly sophisticated and requires significant technical expertise. Ventures such as Open Up Music, Jam Card and Ami show us how digital tech is being used to not only support people, but to transform negative perceptions and social attitudes. None of this is quick or easy work. Ethical considerations should always matter when developing digital tech, but is especially significant when the people who will be testing and using the tech are already vulnerable or marginalised. If people, rather than profit, are to become the driving force behind tech development, then patient capital and user-centred design will be essential. So is socially motivated tech worth the wait? Absolutely. The social and technical challenges are complex and it takes time – on average it takes five to seven years for social tech startups to take their ideas to scale. However, when we look at the lives transformed, and the value that has been unlocked, it’s clear that socially motivated tech is not only worth every penny, but every second too.